Today I tried something new, at least for me. It wasn't the path I planned to take, but in the end it was better. 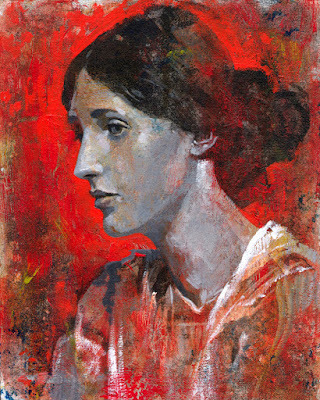 I set out to create a charcoal drawing based on a 1902 photo of Virginia Woolf by George Charles Beresford. The drawing wasn't progressing to my liking, so in a fit of artistic rage, I attacked the image with a kneaded eraser. What was left was a ghost image of Virginia. I figured this was a good time to experiment. Inspired by a collage piece I recently read about, I brushed Elmer's glue over the whole image then spread red acrylic paint over the glue while it was still wet. As it dried, the paint began to crack and form into unique textures. Once dry, I painted the face and shoulders using black and white acrylic. It still didn't feel complete, so I put another coat of Elmer's glue over the image and applied more reds, some yellows, and a small touch of blue. Later, I added more details until I felt mostly satisfied. I definitely want to explore the technique further. It added some great texture to the painting, and it was simply fun. The rapid drying time of the glue and paint allowed me to complete the painting in only a couple hours. I could probably spend another hour or so on small details, but I consider the experiment successful and will let the painting stand as is.